91% organic. 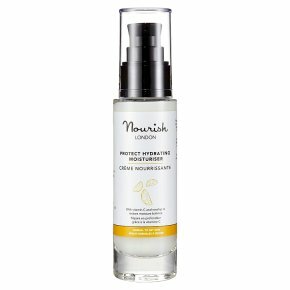 With vitamin C and Rosehip to restore moisture balance. Normal to dry skin. Healthy skin is beautiful skin. Suitable for vegans. Phytoactive Soya and Rosehip seed oils, rich in essential fatty acids, are combined with antioxidant vitamin C to ensure optimal skin nutrition and protect collagen. Potent antioxidant vitamin C from fresh Sicilian lemons helps protect skin from damaging free radicals caused by stress and pollution. Directions: Apply a small amount to face and neck after cleansing and toning. Smooth over the skin and lightly massage in.